Oral Health Promotion Project; Dental Health Initiative Share the Care. THE DENTAL HEALTH INITIATIVE SHARE THE CARE is an Oral Health Promotion project, and a public-private partnership of the County of San Diego Health and Human Services Agency, the San Diego County Dental Society, and the San Diego County Dental Health Coalition. UCSD Dental Health Initiative Share the Care staff build partnerships with agencies, schools, organizations to work with families who have limited resources, providing access to dental care and education with the goal of improving oral health for all children and youth in San Diego County. Preventive Oral Health Screenings/Dental Sealants and Varnish: Organize oral health screenings for children ages birth through 5 throughout the year and coordinate county-wide community engaged dental sealant/varnish clinics for children and youth (0-18). There is no cost to the organizations or families who receive these services. Education: Educate pregnant teens, parents, and caregivers of children and youth on preventive and daily living tips for a healthy mouth and teeth. Training: Oral Health impacts/prevention trainings to staff from childcare sites, community-based organizations, medical/dental professionals, and others who interact with pregnant teens, parents, and caregivers. Technical Support and Community Mobilization: Facilitate community collaboration, task forces, and five-year oral health needs assessments. 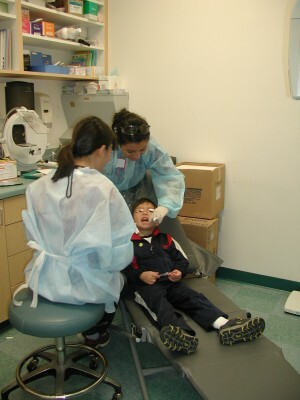 Vision: To ensure optimal oral health for children, youth and pregnant women in San Diego County.